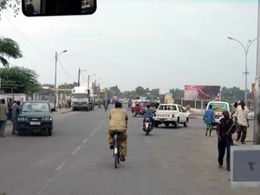 Djibouti (جيبوتي) is the capital city of Djibouti and has a population of around 400,000. The city was founded in 1888 and was designated the capital of French Somaliland three years later. The city has some beaches along its eastern shore. Ambouli Airport (JIB) serves the city, and there are regular flights by Air France (to Paris-CDG), Ethiopian Airways (Addis Abeba), Kenya Airways (Nairobi via Addis Abeba) and Turkish Airlines (Istanbul-Ataturk) flights. There are also regular flights with Fly Dubai (to UAE-Dubai-DXB terminal 2). Passenger services to Addis Ababa resumed in January 2017. Get around by Green TaxiCabs. Some people will tell you to avoid the taxis with the drivers chewing Khat. Khat is not a narcotic, but a stimulant (see: http://en.wikipedia.org/wiki/Khat). It gives the local Djiboutians and Somalis something called Merran (the Somali word for 'energy'). Again, negotiate and you may get a lower price, but there are better things to do than to argue over 500fr (3 American dollars). Beaches on the eastern shore. This page was last edited on 9 February 2019, at 16:37.